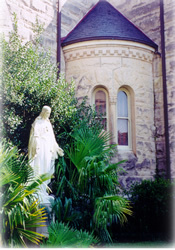 The Convent of the Visitation was founded by Bishop Michael Portier, first bishop of Mobile. Aware of the lack of schools in his diocese, he remembered the fine work of the Visitation nuns throughout his native France. He obtained permission from Pope Gregory XVI to found a convent in Mobile, Alabama. Five nuns from the convent in Georgetown, Washington, D. C. boarded a sailing ship in November, 1832 and arrived in Mobile a month later. The Bishop rented a small five-room house adjoining the property which he had bought as a site for the convent. The nuns lived in this house until a more suitable building was erected. By January, 1833, the sisters were well established and forty pupils were enrolled the first year. In March, 1840, a tornado leveled the buildings. The convent was rebuilt and a hundred students enrolled, indicating that the institution's reputation had continued to grow. Tragedy again struck in May, 1854, when fire reduced the monastery and chapel to smoldering ruins. Contributions poured in from friends far and near. Rebuilding began a month later and the convent was completed for use in 1855. Additions were made in the 70's and 80's. The sisters' dream to erect a chapel to the Sacred Heart was realized through the financial assistance of Madame Camille Marguerite De Poorter and the McGill brothers, Felix and Arthur. The chapel was dedicated in 1895. In the early 1900's the school flourished and attracted many pupils from not only Mobile, but also the surrounding states and South America. In the '30's and 40's vocations were few and the demands of operating a school increased. Rather than lower the standards of the school, whose charter was granted by the State of Alabama in 1848, they closed the high school in 1948 and the grammar school in 1952. The work of converting the former school into a retreat house began in the 1950's. Many people are curious about the staircase in the front hall. Originally these stairs led to a second floor hallway which opened into a parlor similar to the one on the first floor. After several retreatants fell down the stairs, it was decided to close them off and install an elevator and remodel the parlor and hallway into additional retreat rooms. At the present time, a typical year includes retreats for men, women, and young people, as well as workshops and days of prayer for priests and religious, for laity, and for groups of all denominations, marriage encounters, engaged encounters, and Cursillos. The monastery also serves as a distribution center for the communion breads used by churches throughout the Mobile Archdiocese and for many churches in surrounding states. This service is extended to a number of non-Catholic churches as well. In 1957 a candy kitchen was established. Originally started on a small scale as a source of revenue, it quickly became apparent that the popularity of the Heavenly Hash was fast turning the modest facilities into a large business with possibilities for inter-state commerce. It was nonetheless decided to confine the candy-making to a scale more in keeping with monastic living, and the chocolate covered marshmallow confection now serves as a tasty public relations entity. Because, from its beginning in 1833, the convent has played an interesting and significant part in the life of Mobile, it was marked by the Historic Mobile Preservation Society. The marker was placed at the entrance on November 4, 1967. The buildings were photographed and drawn by the Historic American Buildings Survey and copies of the photographs and drawings are in the Library of Congress. In 1971, thanks to bequests from the estates of Mr. Robert M. Harris and Miss Nan Langtry, the sanctuary was renovated to comply with changes in liturgical norms. On October 1, 1981, the Visitation Auxiliary, a group of volunteers who assist the sisters, opened a gift and book shop in the cottage - the building east of the monastery, which was built to be the chaplain's residence. In 1983 a devoted alumna sponsored the refurbishment of the main parlor in honor of the monastery's sesquicentennial year; and in subsequent years her renewal efforts included the front entrance hall and the conference room. The monastery was again recognized by the Historic Preservation Society with an award for architectural excellence, presented on February 13, 1985. Between 1985 and late 1991 the sisters carried out several major restoration projects, including the dormitory and infirmary areas, the slate roof on the chapel, the clock tower and the stained glass skylight over the sanctuary. All of these improvements were made possible by the support of generous alumnae and benefactors, notably the Moorer Foundation, the Mitchell Foundation, and Mrs. Ursula Romano. On December 9, 1991, the Historic Preservation Society presented another award for the effort made during this period to preserve and maintain the integrity of the buildings of the monastery complex. In 1998 the fire-safety of the entire complex was upgraded to bring it into compliance with current codes, and the restoration of the interior of the chapel was begun. The rededication of the restored chapel took place in October of 1999.